It was a time, in the wake of independence that the country was still in turmoil of internal conflicts and social disharmony. Not just the country, the people too were in distress. India was divided in its entirety. Even the radio. Yes, in the name of partition the All India Radio was divided among India and Pakistan. India was left with the centers of Delhi, Bombay, Calcutta, Madras, Lucknow and a few others. In those changing times, the Central Government paid a special attention in giving a new shape to a strong and effective mass media like radio. To make radio a prime medium for social, educational and cultural prosperity, the Government planned to set up radio stations in different parts of the country. The then Chief Minister of Assam, Gopinath Bordoloi requested for setting up a center in North East India. As a result, Assam was included in the plan at the very outset. Accordingly, it was decided that Shillong and Guwahati a radio station each, being the political capital and cultural capital respectively. These stations would have tele connectivity and would collectively form the greater Shillong Guwahati station. Ubedul Latif Barua who was the Program Assistant and Staff Artist Purushottam Das of Calcutta centre started working on Shillong Guwahati centre from the April of 1948. Then from 1st June onwards, Bhupen Hazarika, Phani Talukdar and Birendra Kumar Phukan were given the responsibility of Program Assistants on temporary basis. Chief Minister Gopinath Bordoloi allotted the Uzan Bazar situated Commissioner Bungalow to be used as radio studio temporarily. Thus the All India Radio first anchored itself at Assam on the wide banks of the Brahmaputra. It is the foundation day of Akashbani Guwahati. All India Radio’s Shillong Guwahati centre was inaugurated on this day. Mehera Masani, a lady who had come from Head Office took responsibility as Director in charge of the centre. For both the centres separate positions of Assistant Directors were kept. On the first of July, the Shillong Studio was inaugurated by the then Chief Minister of Assam, Gopinath Bordoloi and the Guwahati Studio was opened by Minister of Information and Communication, Mohammad Tayabulla Sahab. On the 8th and 9th of July, the board formed by the Director General of Shillong’s All India Radio centre appointed Bhupen Hazarika, Phani Talukdar, Biren Phukan, along with Satyaprasad Barua, Syed Abdul Malik, Rousnara Khatoon, Narayan Bezbarua, Ranjan Bora and Mrigendra Nath Roy Choudhury on permanent positions after an interview. In the beginning, Bhupen Hazarika, Narayan Bezbarua and Ranjan Bora were appointed in the Shillong centre. However Bhupen Hazarika was brought back within a month and was given special responsibilities of musical theatre production and publicity. In the Guwahati centre Ubedul Latif Barua assumed the position of Program Executive and Dilip Sengupta as Co-director of the centre. In the formative years, the All India Radio allotted time slots of 7:00 AM to 8:00 AM in the morning and 5:00 PM till 9:15 PM in the evening for Guwahati centre. The programs for the Assamese audience included ‘Akanir Mel’, ‘Semoniyar Sora’, along with a few others which were broadcasted from the Calcutta centre. After establishment of the Guwahati centre various programs were prepared which included songs, talk shows, drama, discussions, interviews and the daily news presentation. A bimonthly program named ‘Aideur Buloni’ was planned for the women audience. It is worth mentioning that the program was named by Jyotiprasad Agarwala himself. ‘Akanir Mel’ was broadcasted once a week. Birinchi Kumar Barua, editor of various children magazines during the 30s and the 40s was responsible for the production and direction of ‘Akanir Mel’. This program is broadcasted even now. In the beginning, Minati Rajkhowa was given the responsibility of producing ‘Aideur Buloni’. Rousnara Khatoon was closely related with both these programs. Among the regular programs, drama was one of them. At first in the Tuesdays and then it was broadcasted every Wednesdays from 8:00 PM onwards with the time scale of 30-45 minutes. The first drama to be broadcasted from the centre was ‘Dhoraloi Jetiya Namibo Sorog’ by Satyaprasad Barua. In the primitive years of Guwahati radio centre, the musical theatre program was one of the most popular. The first musical was Bhhupen Hazarika’s ‘Asomiya Maat’. ‘Asomiya Maat’, directed by Bhupen Hazarika himself also had his voices and words which marked the beginning of an era of Assamese musical theatre. Later on, Purushottam Das, the musical prodigy took the responsibility of production of musicals. His three episode production named ‘Kabir Kamrup’ was a successful musical of that time. However of all programs, the programs of songs and music were given special attention. Birendra Kumar Phukan and Mrigendra Nath Roychoudhury held the production responsibilities for it. Phukan was mainly responsible for planning and management of the programs of classical music and Roychoudhury looked after the segment of modern songs which included the supervision of lyrics, auditions, and contract sign with singers etc. Ubedul Latif, along with Roychoudhury co-directed the weekly voice recording auditions of new artists. In 1952, the music department appointed ‘Konthoswor Porikha Board’. On the other hand, in matters of indigenous music, all variants of folk songs were given special focus. However ‘Borgeet’ was significant among them. The immortal creations of Sankardev-Madhabdev, Borgeet was broadcasted on regular basis. 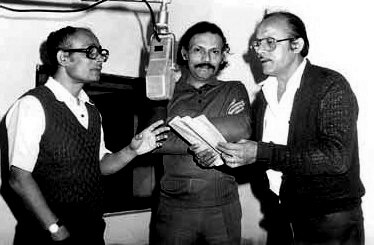 Dayal Chandra Suthadhar from Barpeta Satra, Maniram Gayan Muktiyar from Kamalabari Satra and Girikanta Mahanta from Bordoa Satra were the chief artists for Borgeet. ‘Ojapali Geet’ of Lower Assam was also broadcasted. Deboru Oja of Nalbari was a famoua Ojapali artist. Similarly the young artist Abdul Rahim from Hajo was a talented artist of ‘Jikir’. Artists from Jorhat performed Bihu Husori from time to time. Pramod Bordoloi, an announcer from Tinsukia took the broadcasting responsibilities of Bihu Geet and Husori. Under his able direction, regular broadcasting of Bihu Geet was assured. Another production of Guwahati Centre that popularly drew people’s attention was ‘Goyaa Raijoloi’. This program, in the evening time slot stole everyone’s heart. One of the reason was its ‘signature tune’. ‘Raije Mor Roja Oi, Bukure Bandhoi Oi, Raije Mor Seware Tholi’– were the opening lines of the title song of ‘Goyaa Raijoloi’. Initially it was broadcasted for 30 minutes. However, it was extended till 45 minutes on popular demand. This program had the planning and direction of writer and playwright Phani Talukdar and was supervised by writer Pandit Maheshwar Neog. He also played the part of village headman ‘Dhanbar Kai’. Later on, reporter Kirtinath Hazarika took the broadcasting responsibilities of‘Goyaa Raijoloi’ and introduced a variety discussions, satires, drama, music etc to the program. Apart from general entertainment, those 4 hours 45 minutes was also educational to the audience back then. The centres of Shillong and Guwahati worked in tandem and the program timings were in sequential order, one after another. The centers communicated via telephone. The director of the centre supervised the functioning from Shillong. However in 1953, with the installation of 10kW medium wave transmitter in Jalukbari replacing the older 1kW transmitter, the post of Director was also shifted to Guwahati. As a result of it, the broadcasting capabilities of Guwahati centre increased to Nagaon, Kamrup and neighboring districts. 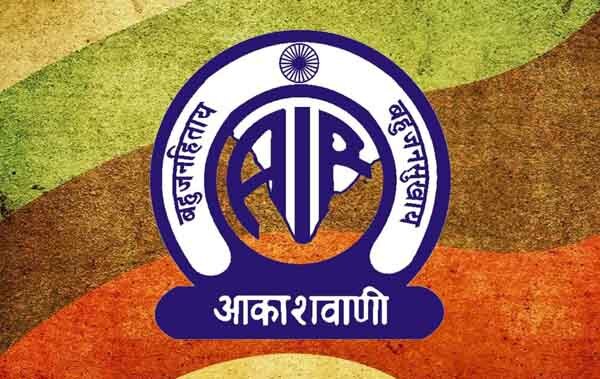 Also, in that same year, the name of All India Radio was changed to ‘Aakashbani’ and the All India Radio Guwahati became ‘Aakashbani Guwahati’. This new name created quite a stir with the pronunciation resembling a Hindi word. However the Assamese pronunciation of ‘Aakashbani Guwahati’ was retained and the matter was sorted out. Preparations were being made to shift the Guwahati centre from Uzan Bazar’s Commissioner Bungalow located in the north of Latasil Playground (present day’s Hotel Brahmaputra Ashok) to a permanent location. The area around today’s AIR centre in Chandmari was a forest back then. Silphkhuri was the last city bus stop. However the construction work sarted and the planning of the new campus soon became a reality. Finally Aakashbani Guwahati centre was shifted to its new premises with modern facilities and advanced technologies in the month of May, 1957. The centre was inaugurated by the then Chief Minister of Assam Bishnuram Medhi. In the initial times, there were objections regarding the site of the new campus which was far away from the city’s core. To this Chief Minister Bishnuram Medhi reasoned that with the passage of time the city of Guwahati would expand beyond its frontiers and this new centre would be the headstone of the future developments. Such a visionary he was! His farsightedness soon transformed into reality and within a few years, Guwahati took to its wings of prosperity and the centre became a landmark of the new era. Aakashbani Guwahati grew up holding fingers of many of the literary and cultural stalwarts of the time. Their contribution is noteworthy and Aakashbani Guwahati’s history is incomplete without their mention. One such versatile genius was Nabakanta Barua, from song compositions to children literature, translating Greek plays to writing novels for radio- his presence was immense! And from 1958 till his death, he was closely associated with Aakashbani Guwahati. Noted writer Syed Abdul Malik became associated with Aakashbani Guwahati after he joined the Shillong Guwahati Centre as Program Assistant. Noted writer and ‘Gyanpeeth’ awardee Birendra Kumar Bhattacharya first worked at Calcutta centre’s Assamese department as Program Assistant and later he got associated with Aakashbani Guwahati. Dr. Bhupen Hazarika was an organization alone. Apart from writing songs, composing music and singing, he also produced his enigmatic musical plays for radio broadcasting. On the other hand, Nirmalprobha Bordoloi’s compositions created a new wave of compositions. Apart from her evergreen lyrics, she also directed a few of the programs such as ‘Aideur Buloni’. Similarly, Lakshyahira Das was closely associated with Aakashbani Guwahati since its birth. She wrote songs and also sang. Like her, many other students of Cotton College back then namely Birendranath Datta, Taffajul Ali, Jyotirmoy Kakoti, Mihir Bordoloi were also associated. On the other hand many creative and talented youth of the era like Satyaprasad Barua, Purushottam Das, Kamal Narayan Choudhury, Maheshwar Neog, Keshav Changkakoti, Mrigendra Nath Roychoudhury and Anil Roychoudhury were already working for the centre. Singers like Hemen Hazarika, Tarikuddin Ahmed, Gyanada Kakoti, Queen Hazarika (Sudakshina Sarma), Anupam Nath, Rani Pal, Rudra Barua, Labanya Bhuyan, Tultul Bharali (Barua) were closely associated too. Many of the immortal creations of Khagen Mahanta and Dipali Borthakur first blossomed at Akashbani Guwahati itself. Playwright and dramatist Arun Sarma was associated with the educational programs of Akashbani Guwahati. Noted poet Keshab Mahanta wrote many Bihu songs for Aakashbani Guwahati. His immortal creations still linger on people’s memories. Dr. Bhabendranath Saikia was associated with Aakashbani Guwahati for over two decades. To reach out to the people in the towns and cities, he conceptualized the program ‘Nogore Sohore’. The first episode was based on Guwahati city itself. This program, recorded at different towns and cities brought Aakashbani Guwahati even closer to its audience. Dr. Saikia also directed a talk show by the name ‘Rosona Likha’ for the school students. He also wrote numerous plays. Noteworthy among them and highly popular among the audience included the series of ‘Jonakir Biya’, ‘Jonaki Buwari Hol’, ‘Jonaki, Maya aaru Moni’. His children play ‘Santo Sisto Hristo Pusto Mohadusto’ especially remain close to everyone’s heart. 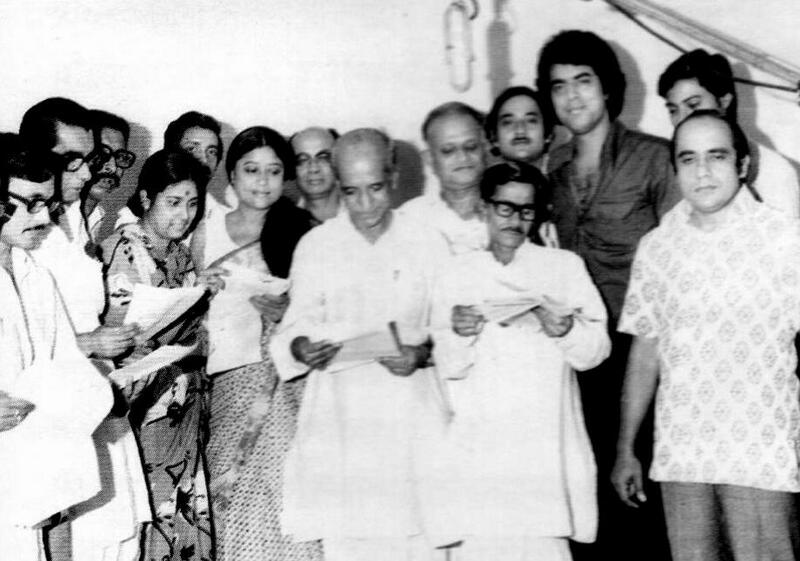 The list is also incomplete without lyricist Kirtikamal Bhuyan and playwrights like Kulada Kumar Bhattacharya, Narayan Bezbarua, Deben Sarma, Mukul Barua, Nirmal Dutta, Biva Goswami, Tassaduk Yousuf, Iva Achao, Shaila Barua (who also worked as announcer). They are an integral part of Aakashbani Guwahati’s history. Dramatist and playwrights for Aakashbani Guwahati include Sangit Natak Academy Award winning Arun Sarma, Durgeshwar Borthakur, Mohendra Borthakur, Phani Talukdar, Satyaprasad Barua etc. The familiar tunes of Aakashbani flows through our hearts like the golden hue of the eastern skies, the crooning of birds of dawn or the lukewarm rays of the morning sun. Tejore Kamalapati Paravate Ninda– the radio’s ‘Bandana’ program was the 6am call for Ketekibari’s Lahori Aita. When Mukul attentively sits near the radio, his mother knows it’s the 7:30am program ‘Jilikibo Luitore Paar’ for students. Its also the time for her children’s breakfast and she would put an extra log to the cooking fire. When ‘Geetimalika’ is played, little red ribboned pony tailed Geetika would hurry to the kitchen and say- Maa Breakfast! Its 8:55am! ‘Aanchalik Batori’- its 9am. The school goers would hurriedly finish off their food and take off for school. Mother finishes her kitchen chores listening to ‘Chitrageet’. Then she would sit for her weaving after a light snack. The radio was such an integral part of the family back then. It served as the family clock too. Each program signified a time period. The radio was indeed the official time keeper. Hence the broadcasting of ‘Krishi Jagat’ said – its 7:00 in the evening or the regional news at 9:25 at night. These programs are indeed etched in our daily lives. The heart beat in the tandem of Aakashbani. Seasons change; time passes along with the passage of radio episodes. The radio touched everyone’s lives. Even now a distant tune when floats around, we know it is our familiar ‘Geetimalika’. The early morning ‘Bandana’ brings back reminiscence of those amazing yesteryears! The radio still brings back nostalgia to many. The birth of Aakashbani was for the harmony and prosperity of the people. Since its inception, Aakashbani has been the platform for the upcoming talents. And with it, Aakashbani also has matured through the ages and it has successfully completed 58 years of existence. In the present context of technological advancements, Aakashbani too has adopted the changes. It has become broader and its reach has been expanded like never before. With these changes, the programs too have changed. Today’s Aakashbani is about the ‘phone in’ programs and they have become very popular. Now a days, many programs adopts ‘phone in’ approach. Apart from it, the ‘live’ programs are also popular among the masses such as the ‘Doctor online’ where the audience can avail the benefits of advice from expert specialists on diseases and general health. The cultural programs too have flourished and the list has prospered and it continues to evolve. With the introduction of newer programs, the evolution of Aakashbani merges on. The FM channels are the new buzz. The commercial programs has not only brought a new change but also touched the lives of many.